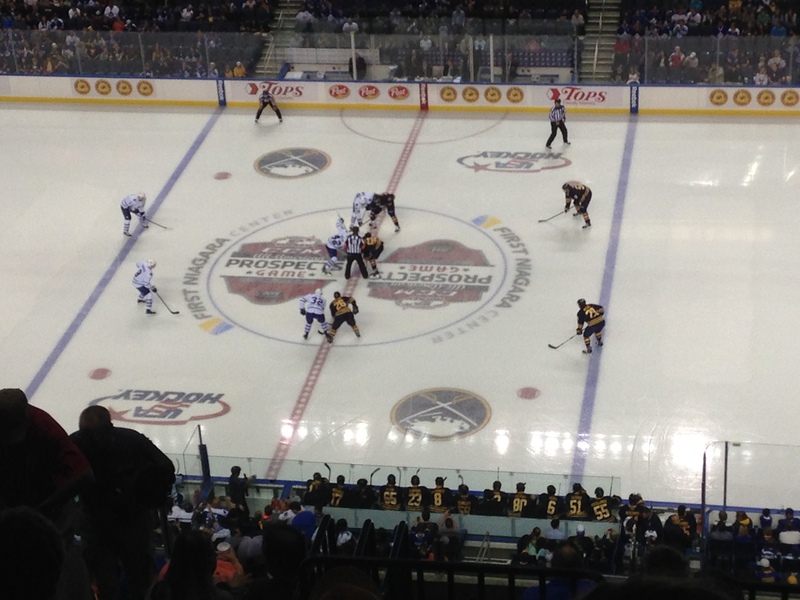 Last Friday night the Sabres matched up with their cross-border rivals infamous for their blue Maple leaf logo. These teams, regardless of their records,seem to bring forth such disdain for the other. 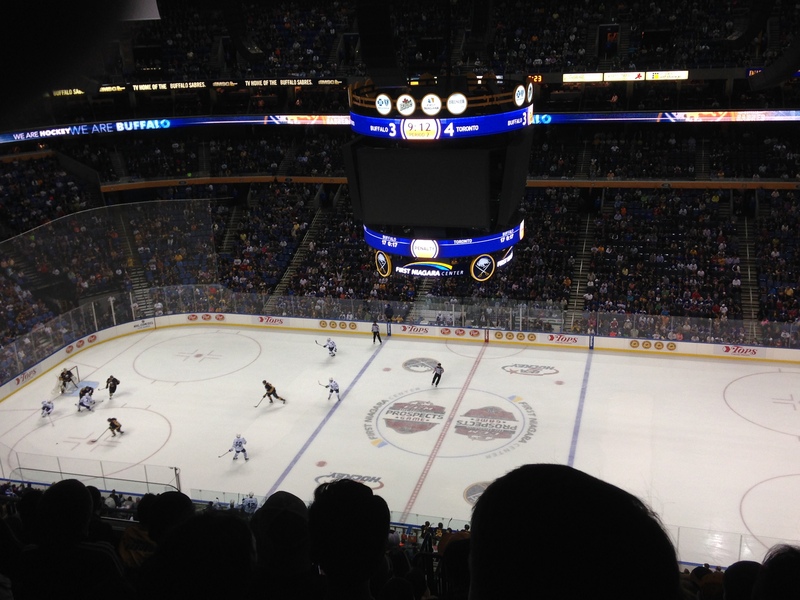 From the moment the Maple Leafs walked into the stadium a bitter intensity covered the ice like cirro-stratus clouds cover Buffalo throughout the winter threatening snowstorms. The Maple Leaf fans threatened to take over the entire stadium. Many of them probably traveled fewer than the eighty miles it takes me to trek from Rochester to every home game. Kessel, Bozak, Phaneuf jersey’s were as prevalent as Moulson, Miller, Vanek, Ennis jersey’s that night. Strangely a Karlsson jersey made it into the game and an un-named LA Kings jersey happened to make it onto the jumbo-tron. How peculiar. My seats against the back wall in the 300’s had plenty of Leaf fans within spitting distance. All-in-all the Canadian fans occupied about fourty percent of the stadium based on the eye test. The fans kept the tight, heavy hitting game congenial. The same was not true for the players on the ice. From the onset of the puck drop the players kept a hard, physical, checking game intact. The named players for the Sabres got their shot at Toronto first. Moulson-Ennis-Stafford, Hodgson-Reinhart-Gionta, Foligno-Mitchell-Stewart almost all of them are expected to make the opening day roster while Flynn-Schaller-McCormick got action this night; only McCormick of them is expected to make the opening day roster. Reinhart, Foligno, Mitchell, Flynn, and Schaller were out to prove their meddle. For defense Pysyk was out (inj) so McCabe saw time with Myers. Weber with Ristolainen, and Zadurov with Meszaros. The players were physically inept for the first period. Not only were they continually knocked off pucks, they also couldn’t knock any Toronto player off the puck either. 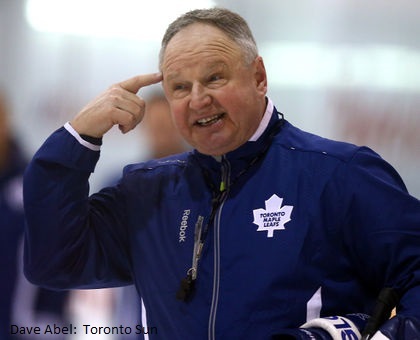 Their hits were brushed aside like silly thoughts to Randy Carlyle’s genius. Toronto kept possession for much of the first, admittedly in their two thirds of the rink; managing only six shots on goal. All three goals of theirs in the first came from Buffalo’s focus on hitting the player rather than going after the puck. Chris Stewart was the only Sabre to respond in kind to Toronto’s hard-hitting ways as the first period unfolded. Stripping the puck, being in the face of every Maple Leaf jersey he saw (only the glass prevented him from cross-checking Toronto fans in the first two rows), and scoring two goals to Toronto’s three. The rest of the Sabres tried too hard to be physical at the cost of playing sound hockey. Their pass-heavy plan failed due to its inconsistent passing and lack of fluid skating. They were left vulnerable to Toronto’s pounding. Many a times a Sabre received the puck while standing still. Buffalo was slow, passed slow, hit slow, skated slow for the first twenty minutes. Only Stewart’s line (Foligno, Mitchell) kept pace with the enemy. Something happened after the first intermission. Buffalo, blue and beaten after twenty minutes which must have seemed like its own sixty minute game, emerged from the dressing room blue and golden. Physical and open became their style of play. They dictated the tone of the remaining fourty minutes. Delivering hits, playing with intensity and speed, the game became a true competition of grit and prowess. Neuvirth, Weber, and the rest of the defense not named Myers or McCabe were the only obstacles preventing the Sabres from imminent victory. Neuvirth was personally responsible for at least two of Toronto’s six goals. He never got high to stop those shots – congrats Toronto for proper scouting. Toronto shot high on him all night converting twenty seven percent of the time. At least four of the six goals were high. Weber on the other hand was not just slow but lacked eyes on a developing play. He looked as lost as a deer in the headlights of an oncoming car along the 90. Like that deer, he had no reason for being on the ice being responsible personally for two of the oncoming cars’ goals. His pairing mate Zadurov just didn’t back him up nor adjust to meet Weber’s inefficiencies. Toronto skated in with ease while those two were drawing blanks for eyes forgetting if they were deer or hockey players. Since I am focusing on D-men this season Meszaros, whom pleases me as a signing, and Ristolainen had their own miscues. They were as porous as sand. Sure they kept Toronto to twelve shots in two periods but they allowed the Leafs to get far too close to Neuvirth for anything but a goal. Those four D-men were catalysts for Toronto’s twenty-seven percent shot ratio, four percent higher than the feared and dangerous Penguins or Capitals PP% for all of last season. Highlighting the defense, the combination of Myers-McCabe were on fire! From the get-go they were melting the ice. Their physical play, their focus on stealing the puck, their speed to play defense from an offensive position on the ice was a major catalyst in Stewart and Mitchell having a prominent role in the first period. Kudos to Foligno for being the anchor-weight on that line! Those two players (Myers-McCabe) kept the Sabres as close to winning as possible. Myers even managed to demonstrate a physical intensity. 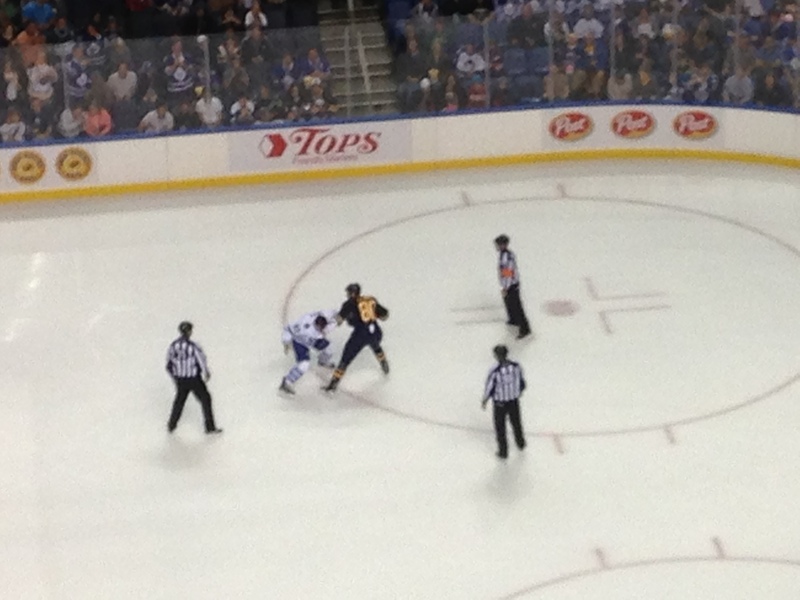 In the third period after a cheap shot against him while in the corner he got into a scrum. Though his attempt at a fight lasted only five seconds before he fell over, he Carrick through their gloves down and fought. Officially his attempt at a fight was ruled as a double minor for roughing. All-in-all the Sabres showed their grit and prowess to attack in a physical game while trailing. As there are expected only three forward positions open for the regular season according to Bill Hoppe of BuffaloHockeyBeat.com. Mitchell, after Friday’s performance, is a strong contender for one of them. In my view Dalpe made a strong case for inclusion into the roster based upon last Tuesday’s game. The test gets tougher with tonight’s tilt in Toronto (try saying this sentence three times fast). Only Reinhart, who’s presence has been questionable on the ice despite knowing he is in the lineup, of the nine seen as competing for the last three forward positions will not be facing Toronto in Toronto. Defenders Bagnall, Petrecki, and Strachan, will get in on the pre-season play and opening day roster availability. The defensive spots are harder to acquire. Weber, who is expected to play, may be making a roster spot easier to acquire. Side note: On the physical violence of Friday’s game – I saw nothing over-the-line from either side. None of the three official fights (and certainly not Myers’ attempt at a fight) appeared to be staged nor did any appear to be a scrub VS a star. Even the McCormick-Phaneuf non-fight was not a scrub VS star as Phaneuf was taking liberties with some line-mates of McCormick and with McCormick himself. The hits, ‘finished-checks’, and overall physicality of the game did not appear beyond the context of the game itself. Neither team allowed for cheap shots. Those shots that did occur either the players or the refs took appropriate actions. Friday’s match was a testament to how refs should handle the more physically dominating games – be them in an open or closed system. The refs took immediate action to cheap shots often assessing penalties, players themselves did their best to quell cheap-shots immediately. My first star of the game goes to every referee on the ice that night! P.S. I am a proponent of fighting in the NHL but only when it occurs in the context of the game and especially when liberties are taken against any players. Players should be able to defend themselves appropriately, team-mates should be able to stand-up for one another while playing hockey. Emphasis on being able to play the game of hockey. This entry was posted in Buffalo Sabres and tagged Bill Hoppe, Bozak, Buffalo Sabres, Chris Stewart, Cody McCormick, Jake McCabe, Meszaros, Mike Weber, Neuvirth, Phaneuf, physical, Rasmus Ristolainen, Sam Reinhart, Toronto Maple Leafs, Torrey Mitchell, Tyler Myers, Zadurov. Bookmark the permalink.